In the woods of Northampton, a bandana-less Leonardo is lost in his own mind. Disheartened, he wonders to himself if he is in control of his destiny or if some higher power has already planned his beginning and end. Leo thinks about the larger forces, both physical and spiritual, that have controlled him over time and begins to doubt his own autonomy. As he observes the natural world surrounding him, he comes to the conclusion that his “fate” is ultimately out of his control. 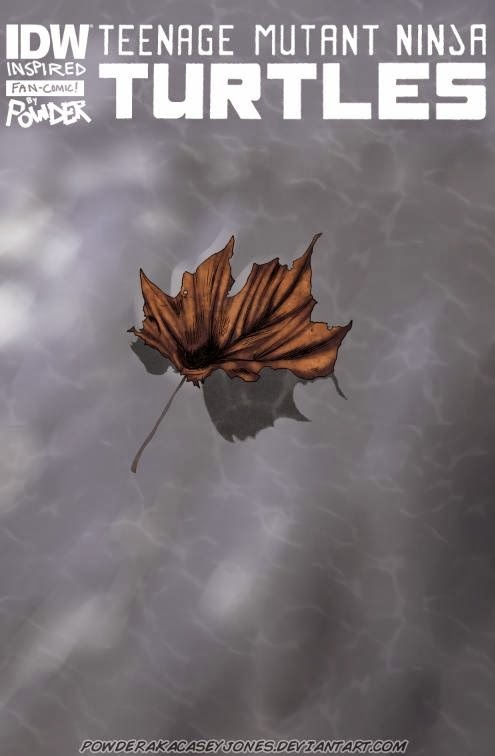 In that regard, he is no different than any other living thing on the planet, all of which could live long lives or find their existences cut short due to circumstances out of their control. Leo takes comfort in this, knowing that ultimately his future is unknowable and thus beyond his complete control. Leo then starts to reflect on the decisions he has made and how they have hurt others. How Casey nearly died at the hands of the Shredder, how April’s studies have suffered due to his problems invading so much of her life, how his lack of presence during the Gang War caused his brothers to undergo both physical and emotional pain, and also how much his father, Splinter, has suffered in response to his son’s suffering. With that, Leo suddenly has the epiphany that his actions have had consequences for himself and for those he loves. Not the actions of others controlling him, but his own choices; his own free will. While “destiny” remains an abstract concept, Leo concludes that he still has the freedom to carve his own path in life and, as leader, to better the lives of his family and friends through his own choice of action. While he understands that taking control of one’s “destiny” ultimately invites accepting the consequences for one’s decisions, Leo is willing to bear that burden. He feels he is strong enough to carry the weight of the world now, because he has to be. Finding this purpose brings him peace and so, donning his bandana and gripping his swords, he feels he’s ready to return to his mission. *Powder has made his 9-page comic viewable on his DeviantArt page, Here. *This story takes place within the IDW TMNT continuity. Specifically, it’s events occur during the “Northampton” arc, which began in TMNT (IDW) #29. 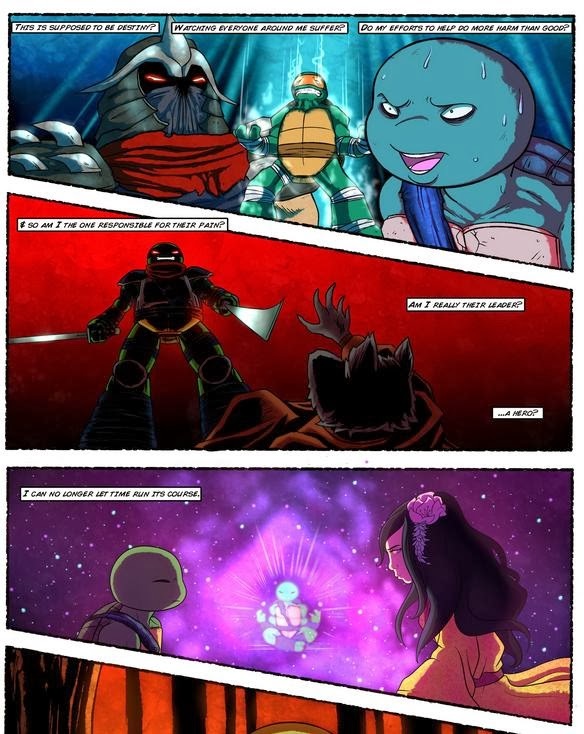 So long as there’s an echo of professionalism to it, I’m always willing to take a look at some good TMNT fan comics. While some of them lack the polish of an official publication, the passion is always evident and that can be much more rewarding to read than, say, some freelancer’s unenthusiastic workmanlike submissions. TMNT fan artist and community member Powder certainly has a passion for the characters and his various pinups and gag pieces over the years have been fun viewing. 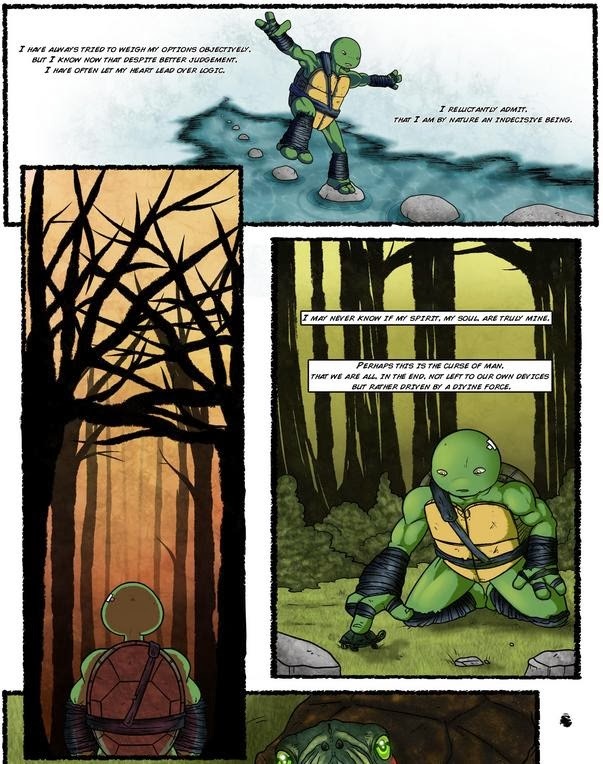 “Mind of a Leader” is his first sequential TMNT comic, I think, and the narrative displays a great understanding of the character of Leonardo, who is wallowing at his lowest point. The story takes place early in IDW’s “Northampton” arc, with Leonardo still reeling from the events of “City Fall” and what the Shredder did to his mind and spirit. As IDW’s comic is titled “Teenage Mutant Ninja Turtles” and not “The Leonardo Show”, the page space during “Northampton” had to be split amongst all, like, 7 or 8 primary characters. So even though what Leo was going through was arguably one of the most “important” subplots of that arc, it still had to share the spotlight with what everybody else was doing. So Leo kind of spends much of “Northampton” pouting by a lake and getting snippy with his family. His internalized, spiritual revelation does eventually arrive, but he’s hardly the star of the show. “Mind of a Leader” expands on Leo’s dilemma with an extra 8-pages delving into his psyche via inner monologue. Having been written before “Northampton” was even halfway through, there are some inevitable contradictions between this short and the main story (namely the circumstances behind Leo getting his blue bandana back), but I think it’s ultimately pretty pointless to hold minor discontinuity against a fan-work. What’s more impressive is how well Powder has managed to read the character of Leonardo and, in a way, predict where IDW writer Tom Waltz was going with the character. Waltz would eventually tackle the internal struggle for control Leo was going through… in an issue published two days after this fan-comic (and hitting most of the same beats). The major theme of “Mind of a Leader” has to do with Leonardo questioning the amount of control he has over his life. It's similar in ways to the Mirage miniseries “Blind Sight”, but what took that miniseries 4 issues to explore, Powder succinctly summarizes in a mere 8 pages. When you look at the IDW series, you can see how Leonardo might be having doubts about his own sense of free will. Unknown forces reincarnated him across centuries, a freak accident mutated him into an anthropomorph, everyone he knows seems to be serendipitously linked together in impossible ways… Really, the Shredder brainwashing him into a stooge was just the straw that broke the camel’s back. Like another Leonardo-centric vignette, the Mirage short “Secret Spirit”, this story is written with a stream-of-consciousness patterned flow of ideas. Leo’s internal monologue is running at a mile a minute as he grapples with heady, philosophical concepts that are beyond his ken. And yet there’s a rhythm to his metaphysical wanderings and you can tell when he comes to new conclusions, and when those conclusions sprout new questions which lead to new conclusions and so on. There are stages of growth present in his thought process and his ultimate decision does feel like an organic one. There isn’t any levity in “Mind of a Leader”, because it’s not that kind of story. Some folks might potentially find it to come across as melodramatic, but Leo’s a pretty joyless stick in the mud as a rule. So a vignette centering on him, and especially one set after he’s just undergone a serious mental battering, warrants this tone in terms of context, if nothing else. There’s a lot of polish to Powder’s scripting, though his art seems to still be in the developing stages. There are a lot of ambitious panel layouts, especially for a story that can visually be described as “Leonardo stumbling around the woods and crying for 8 pages”, so Powder deserves credit for drafting things in as dynamic a manner as possible. Some effects could use a little more practice, like the foreshortening at the bottom of page 2 or some examples of scale being out of whack (Casey’s mask on the table on page 5). But you can see all the potential in Powder’s pencils and it’s really just a matter of tightening up some of the fundamentals. His coloring is worthy of note and deserves some special attention. While he doesn’t go for the “flat” look like primary IDW colorist Ronda Pattison, his use of various effects in terms of lighting or atmosphere are executed in a way that complements the pencils rather than drowns them. So if you’ve been reading the IDW series, I’d recommend giving “Mind of a Leader” a look-see. While the art can be a little rough in places, the characterization is solid and, thematically, it complements Leonardo’s arc during “Northampton” rather intuitively.